It's been quite a whirlwind so far - Dina, Laurie and I loaded the Clampett-mobile and headed down the road to Boerne, Texas, to get to work setting up one of the buildings for the Kid N Ewe Fiber Festival. Our road trip was a giggle-fest and pie-binge, and we made great time. When we arrived at the fair grounds, the first job was to tape out the vendor spaces in the huge room. 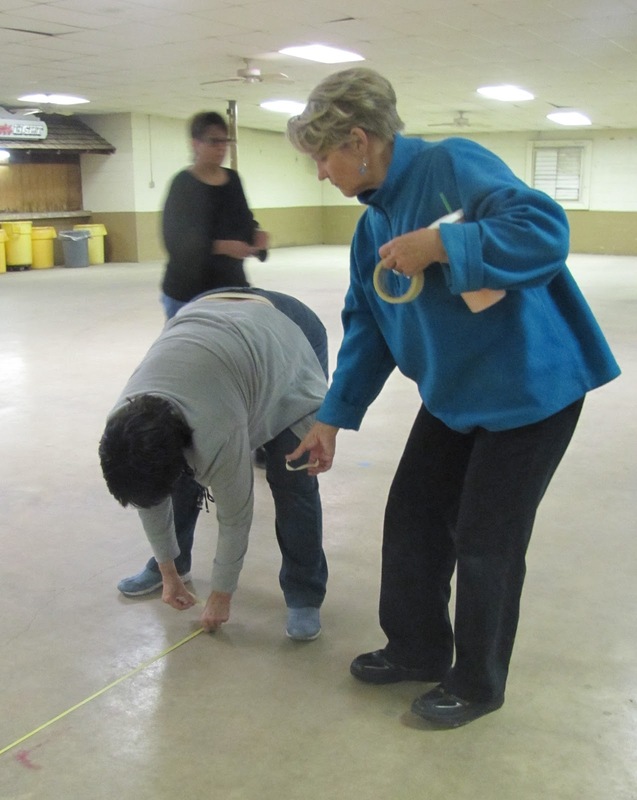 A team of six amazing ladies dove in with 100' tape measures and masking tape. I tried to imagine what the building would look like twelve hours later once all the vendors were set up and doing business. The next morning, the vendors began to arrive and turn that cavernous room into a bustling fiber market, exploding with color and texture. I was very pleased with our new banners and display system. PVC and zip ties make the world go 'round. Our Spin-off Competition display looked very impressive - those alpaca fleece samples looked really great - congratulations to the winning fleeces! STAR (State of Texas Alpaca Ranchers) also sponsored its first Fiber Arts Competition. The entries were all so pretty - made of alpaca fiber, of course. Our Workshop area hummed with activity as well, both Friday and today. Here's the Etsy 101 class soaking up some good information. Laurie always draws a crowd and starts the stitching and spinning circles - wherever she is, is a party. She taught a happy knot of crocheters how to make the Queen Anne's Lace scarf, some who'd never even crocheted before. That's talent. This warm congenial spirit brings us back year after year, to share fun times with each other and our fiber obsession. And if that weren't enough, the farm received another wonderful gift... I had made the decision to invest in one of these darling (but critical) tumblers, made by hand by the cool folks at Windmill Crest Farm. But before I could give them my credit card, I learned that the tumbler had been purchased for us by a generous donor. I was bowled over. How blessed can we be? Thank you, sweet benefactor! This will open up the fiber processing bottleneck we've discovered as we tried to clean a hundred pounds of alpaca fleeces this summer. Now all I need is a gently used leaf blower, and we're in business. This tumbler/leaf blower combination gets a ton of the dirt and grass out of alpaca fleeces before it goes into the wash water. It can shave several wash/rinse cycles out of the process, and save us lots of time. The sooner the fiber is clean, the sooner it gets to the processor. And the sooner it gets back into our hands. Yes, of course, we're shopping here at Kid N Ewe - here's just the tip of the iceberg of our haul to date. (Pictured are just the small, colorful treasures. It doesn't include the large puffy bags of delicious fiber we've amassed.) I have set the record for the least money spent so far - $4. I raided the bargain bin and found a few goodies, just to say I did. I almost threw my hands up, grabbed Liz, and drove down there today. It looks like everyone is having so much fun - hope Sunday is a great day as well! I'm going to have to plan on attending next year. My In-laws live in the area. I'll check some of my resources for a blower.